I am a mom and I work out and I look how I look so just want to share what this print looks like on someone with curves, badonkadonk and not a young mid 20’s full time athlete. I was quite curious myself about this print because a pattern like this can go either way, either be totally slimming or totally unflattering. I am probably getting these pants in safe black as I am not brave enough to wear these out running or to crossfit (ok maybe solo runs but definitely not crossfit -too many boys). Although strangely I am brave enough to share this with this intimate little corner of the internet. What can I say, I’m a conundrum. Also, I think I’m going to size up in these since they fit decidedly snugger then my Mind Over Matter Run Crops in the exact same size. Size reference: I’m a TTS 10 but in my run crops I like to size down to size 8 for compression and a snugger fit around the waist. 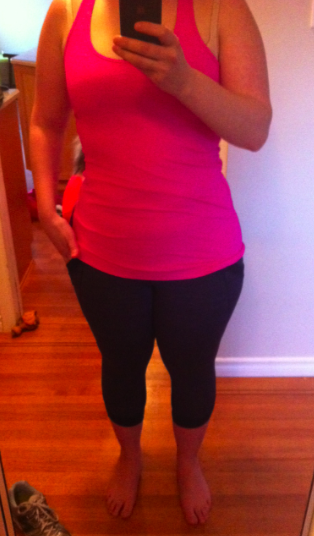 These are size 8 and fit snugger than my other 8 run crops (Mind Over Matter and Dash Tights). I would not suggest you size up in these, but if you are like me and size down in run crops then you may find these snugger then your other run crops. I think I’m the only person that sizes down on run crops though. 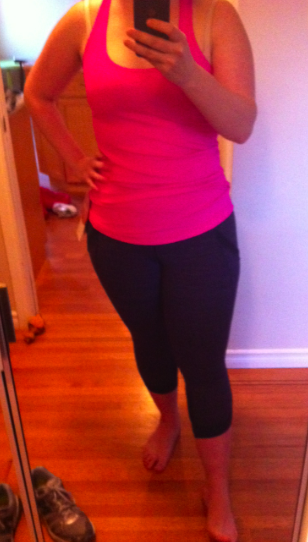 "Run: Chase Me Crops Paired with Paris Pink"
"Pack and Go Pullover and Run: Chase Me Crops"
You do look great!!! Is that the Paris pink every yoga tank? You look awesome in these pants! I love the pockets and the curve at the leg opening! How does it fit and is it comfortable?? Yep you look beautiful! I can totally see the change in your body. Keep up the good work you super mom you! You look awesome Lulumum!!!!!! Keep up the great work!! You are a great inspiration to all mums out there.